The Unknown, Entertaining Mind of Miss Dena Jones: Happy Birthday, Rio! A bunch of us Simply Betty fans are celebrating her daughter's birthday today. Happy Birthday, Rio! You should have arrived here from Trish' blog. If you just joined us and want to start from the beginning, visit the Simply Betty blog and start there. We're all using this cute Rio Zombie digi for our projects. I inked her up with Copics. The paper is by Authentique. Since Rio is a bookworm, I chose some paper with text as well as paper with a notebook paper pattern. I inked the edges with TH Black Soot distress ink. The sentiment is by Hero Arts. I finished off the card with a touch of bling. Hope you like it, Rio! Have a great day! Please hop on over to Sharette's blog next. Very cute card Dena. I love those papers. Great CAS card. Great image....and I love those background papers! You got that zombie skin absolutely spot on! Very pretty card. Love the papers and your coloring. TFS! oh this turned out so FAN TAB U LOUS!!! I know she will love it when she opens it up! 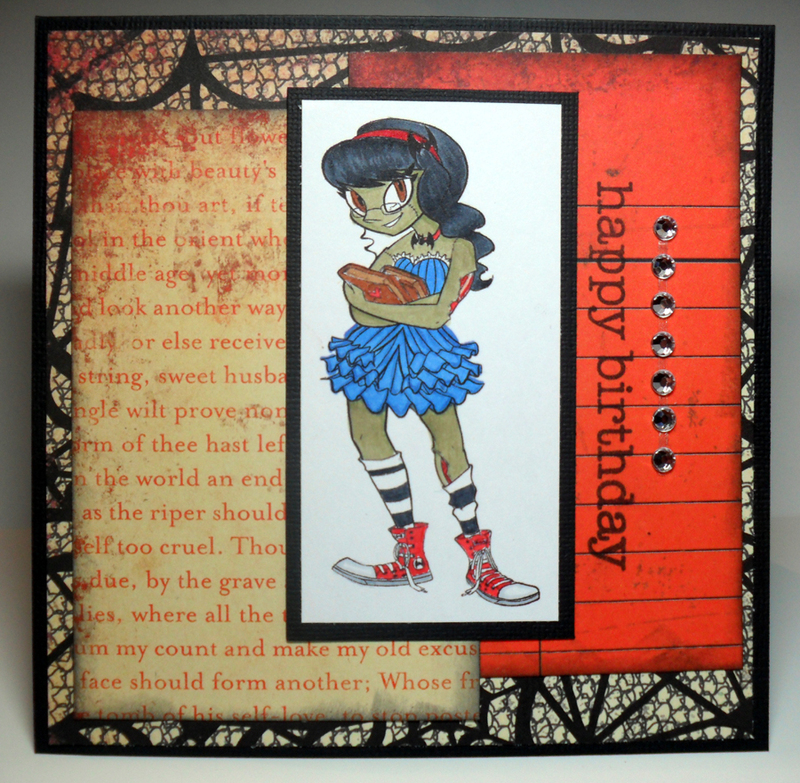 Simply B Burlesque 2 Release Blog Hop!